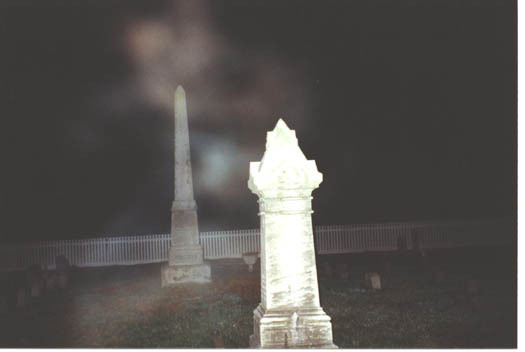 I took these photos quite a while ago when I was ghost hunting at a local cemetery. I had gone there basically every evening for a week straight and had not gotten anything. However, this particular night when I was walking around, a started to walk through dense “warm” spots. Which seems to be counter to everything I had ever read. Usually, we look for cold spots, but this was more much warmer than the ambient temperature. At one point, when I hit the warm spot, I took several photos in succession. When the flash went off, I could see a blurry mass in the light, but not visible without the flash. The photos where in quick succession and looks to me like something manifesting. That was all I got that night, but the feeling was definitely oppressive in the cemetery. The home was actually a railroad style duplex. That is, two side by side apartments that was just a straight floor plan. You actually had to walk through every room to get to the living room. It was an odd layout to me, but I’m told railroad apartments are a thing. Once we arrived, we found a very nice family, with younger children huddled together in the living room. The children varied in age, with oldest son being fifteen years old. The family had told us that they recently moved from Florida, and after the move was the beginning of the phenomena. As we set up the equipment, the children fell asleep together in the living room. We sat around a small round table, all of together in kitchen. It was then that the phone rang. The father answered and it was a call from 911. They asked what was the emergency? The father stated that no one had called and there wasn’t an emergency. This happened two more times, each time the operator growing more agitated. However, no one was making the calls. At around 1 in the morning, some team members and the parents went out on the front porch for fresh air. I remained behind with another investigator, and we stood across from each other, chatting int he narrow kitchen. Next to me, there was a shelf with some kitchen items on it that included a broken toaster with the power cord wrapped around it. This toaster looked like someone had taken a baseball bat to it. Just like the printer in Office Space. As I was talking to the other investigator, the toaster slid across the shelf, stopped next to my head, and popped like there was toast in it! I saw this from the corner of my eye and just as I asked him to verify what we had just seen, the father came running in the house. He told us to be quiet, that his kids hadn’t slept and he didn’t want us to wake them. I said we weren’t talking very loud, only in hushed tones. He said he heard us screaming for him to come inside! Of course, we never screamed for him. We wrapped up the investigation for the evening. Upon further investigation, we found that the son had been involved in demonic rituals while they lived in Florida. He and his friends were attempting to ask spirits to help become more popular at school. (strange?) But really, they probably invited some bad entities into their lives. In the end, an experienced lay demonologist performed a suffmunigation on the home, which is really a lay person’t ritual to remove spirits. As far as I know, all is well. They were lucky. For the last 10 years, give or take, we at Ghosthound.com have been investigating a strange log cabin in the woods of Harwinton, CT. Located on South Road, the Roraback Wildlife Preserve is home to this mysterious structure in which we have experienced various forms of paranormal activity. Searching through miles of 35mm negatives, and more recently digital camera images have yielded many pictures of orbs, fogs, streaks, and the occasional face. We have heard distant screams, had hair tugged, hands touched, and walked through defined warm and cold spots. A figure of a somewhat elderly man was once seen through an infrared night vision scope. One fellow ghost hunter even suffered a minor attack. His back was scratched, in a row of four, from his shoulder to his hip, badly enough that it was red, swollen, and raised.Stories of ax murders and such circulate, as they always do, but the common legend that we heard the most was as follows:There was originally a house that burned to the ground, killing the family. The land was bought by another family, who built the log cabin. The man then went insane and killed his entire family, then himself. The property was then bought by a priest, who converted the cabin into a church, and was later crucified at his own altar. That seems like an awful lot of tragedy to happen in this one place. It would stand to reason that given the history of the land no one, not a priest, or a homeowner would want to buy this place. Legends of haunted houses and such are often exaggerated, distorted through time, or sometimes just made up. This story seemed to us no different. Still, our investigations have been productive, which left us with activity but no answers. Until now.After digging through some online public records, we uncovered a newspaper article from 1937, which gave us a really big piece of the puzzle, and pointed us in a new direction. As it turns out, the 3,300 acres now known as the Roraback Wildlife Preserve was once a farm, but was purchased by John Henry Roraback, one of the most powerful politicians of the early 1900s, and founder of Connecticut Light and Power. Roraback bought the land for hunting. According to the Time newspaper dated Monday, May 31, 1937, Roraback took his own life with a handgun shot after a morning of target practice. The 67 year old man had been battling streptococcus infection for over a year, and acted out of free will, not mental instability. Years later the Rorabacks, a powerhouse family of lawyers and politicians donated the land to the state.With answers, more questions are raised. The biggest being, is this cabin in the woods of northern Connecticut the hunting lodge that John Henry Roraback committed suicide in? What were the details of how he was found dead? Powerful politicians are often targets for assassination. Could he have been murdered, and mistaken for a suicide? In these 3,300 acres, is there another structure? Who can we contact for reliable answers? Is it possible that the image in the night vision scope was the ghost of Mr. Roraback? We hope to find more answers, even though they inevitably lead to more questions. If anyone can provide us with answers or at least point us in the right direction, or guide us to anything else in those woods, please contact us. Borley Rectory carries the dubious distinction of Britain’s most haunted house. In perspective, there is nothing exceptional about the case. There are the typical sightings of apparitions (as opposed to ghosts), cold spots, poltergeist-like activity and a legend shrouded in mystery. Even the building’s physical appearance lends itself nicely to the legend. What is exceptional is the inordinate amount of press coverage and attention it has received, mainly due to the personal involvement and intervention of the famous English “ghosthunter”, Harry Price (founder of the National Laboratory of Psychical Research of London). The site of Borley, (around 60 miles north east of London in the Essex countryside), was first noted in the 1066 Doomsday Book where a Borley Manor was situated – it follows that a wooden church would probably have been built on the site. It’s history is shrouded in myth and mystery, but the first indication that something was amiss on the site of Borley was in 1362 when a Benedictine monk attempted to elope by horse drawn coach, with a nun from the nearby nunnery. Their plans were thwarted – the monk was hanged and the nun was bricked up alive in the walls of the nunnery. The red brick building that was Borley Rectory was built by Reverend Henry Dawson Ellis Bull (rector of Borley) in 1863, who later settled there with his wife, Caroline Foyster (where she mothered 14 children). In time, witnesses reported seeing stones being thrown from some invisible source, ghostly footsteps were heard and the specter of a nun, the most reported event at Borley, began to be seen, often in broad daylight and on a stretch of ground to be named the “nuns walk”. On July 28, 1900, three daughters of Henry Bull saw the nun and, assuming she was flesh and blood, went to greet her as a guest on the grounds – she mysteriously disappeared. The nun was also seen standing by a gatepost on four separate occasions by a passing carpenter. It was in 1928 when the full haunting of Borley Rectory got underway. ( This is also the time when Harry Price became involved – Price was later to be accused of fraud). The Bull family had died one by one, or moved away, and after a short period standing empty the Reverend Guy Smith and wife took up residence. Immediately, there were reports of whispers in the night, the sound of footsteps, objects being thrown at guests, illumination from dark rooms, two maids saw the apparition of the nun and even a phantom coach was seen. The words ‘Don’t Carlos, don’t’ were, reportedly, wailed late at night on more than one occasion – Carlos was the nickname for Henry Bull. In 1929, and at their wits end, the Smiths contacted the Daily Mirror, a British journal, requesting help. Harry Price then invited himself to the Rectory to carry out a full investigation. On their first visit the group, comprised of Price, his secretary and a reporter, all witnessed what they described as “poltergeist activity”, spontaneous displacement of inanimate objects, strange odors, cold spots and the sound of galloping horses to name but a few. Most notably, the Daily Mirror reporter, Mr. C.V.Wall, saw the nun. Within a year, the Smith family left the Borley Rectory forever, dismissing their move as forced ‘due to a lack of amenities’. In October of the same year, the Reverend Lionel Algernon Foyster, wife Marianne and daughter Adelaide moved in. Within a year, the activity increased to such an extent that, after a visit from Harry Price he voiced his fears for the family’s safety. Reportedly, the phenomena had become more violent and Marianne appeared to be the “focus” of the attacks. She was assaulted at least twice, once being struck in the face, another time being flung from her bed after an “exorcism”. Perhaps the most interesting paranormal evidence came in the form of notes and wall writings addressed to Marianne. During the investigative period, Price claimed that at least 2000 separate paranormal events had taken place. Not surprisingly, in 1935 the Foysters left Borley Rectory and two years later Harry Price leased the house for a year. He conducted endless experiments and vigils but the activity appeared to have subsided considerably. At this time Price was accused of fraud on several occasions (Price was allegedly caught with a pocketful of pebbles after a short pebble throwing, assumedly paranormal, episode concluded. After a séance on March 27, a message was received that ‘Sunex Amures and one of his men ‘ would burn down the rectory that very night. Nothing happened that evening but on February 27,1939 a fire broke out at midnight and razed the building to the ground. To this day the site that Borley Rectory occupied holds a certain mystique for parapsychologists and psychic researchers. It is unlikely that all the reported events at Borley were fraudulent, but there is evidence and testimony to bring ALL of Harry Price’s conclusions into question. All the families leaving the rectory claimed that their decision was in no way related to any strange activity regardless how it was reported in the press. Of course it is entirely possible the families were seeking to avoid potential ridicule and harassment they may have received for supporting such incredible claims. Unfortunately, as Borley Rectory no longer stands no one will ever know the truth, only the legend remains – a fitting epilogue for Britain’s most haunted house.